Decatur House is unique in this country: the work of a great architect Benjamin H. Latrobe, built for a great American naval commander Commodore Stephen Decatur, is well preserved to this day, and within the house are preserved the original drawings. This is a set of circumstances impossible to equal elsewhere. The correspondance between Decatur and Latrobe is largely in existance, in the possession of his descendants in Baltimore. The full content has not been made public, but in one letter Decatur directs that the house be made as plain as a ship". The exterior certainly has the simplicity and honesty that Decatur wanted, and that Latrobe so skillfully could give it. The highly architectural hall, however, can hardly be called plain, though its apsidal plan and vaulted ceiling are simple in form if highly sophisticated in character. In the great suite of formal rooms on the second floor, the forms are simple, and the finish, while it has elegance in detail and material, is sparse in its usage. The first of the latrobe drawings is dated January 1818 and the last in April of the same year. These comprise nine drawings on bond laid paper of plans, an elevation, a section, and details of the hall, and of doors and windows. Unfortunately, the front elevation and the principal or second floor plan are missing. However, the form of the house is conclusively determined by them and also the fact that considerable deviations were made from them in construction. On the exterior, we know Latrobe intended the house to be plastered, but from the brickwork we know that this was not done, and the brick was laid to be exposed. Also we know he intended windows on the front of the second floor uniform with those on the north side which have normal height sills. However, those in place are original and they extend to the floor. The ground floor windows were intended to be the same height as those of the third floor, but were built much shorter. Lastly, on the exterior Latrobe intended the windows to have blinds, as shown on the drawings, but we know they were not hung until the recent renovations, as there were no marks of hinges on the Jambs, and projecting balconies on the second floor windows would have prevented their employment. It was for this reason in the recent work that the balconies were removed, end flat grilles, to match the fine railing at the front door, substituted. On the interior the changes entailed throwing together the two south rooms on the first floor and introducing a main stair, to supplement a secondary stair Latrobe provided to the north. On the second floor we cannot follow the changes as the plan is missing. On the top floor the double apsidal form dressing room was modified to a plain rectangle. In detail there were various modifications, in fact on the ground floor all of the doors were built to details unlike the original, though on the second floor, Latrobe's details were carried out, except in the case of the great triple opening between the north and south drawing rooms. The reason for these changes has to be speculated upon, but it is probably not hard to assume the correct answer. Latrobe left Baltimore, his long time residence, in December of 1818, for New Orleans to continue the construction of his waterworks, which had been held up by the death of his son there from yellow fever. 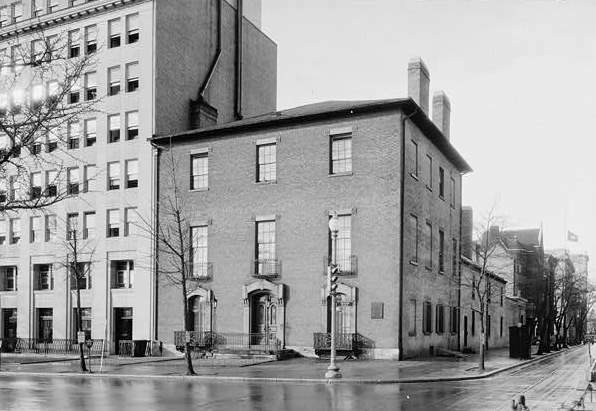 At this time the foundation for Decatur House could hardly have been more than laid, and as the house rose, Decatur and his builder were free to make changes without the advice of the architect. Therefore, the design never possessed its original intent, and only recently did it gain the larger part of it. In 1870, on the purchase of the property by General Edward Beale, the design was further denatured by the removal of the original arched doors and the windows on either side, and by the substitution of new ones with ponderous brownstone Jambs and lintels, and by the painting of the old Aquia stone brown and of the trim dark. The north elevation was painted yellow to match the stucco work on the wing and perhaps to weatherproof the wall. Several years ago, Mrs. Truxtun Beale discussed the Victorian changes with me, and I suggested that if the brownstone trim was removed and the openings repaired that a washing of the brickwork and rehanging of the shutters would return to the house a large part of its originally intended appearence. This she decided to do last Spring, and the work was carried out during the summer. The change in both elevations was amazing. On the H Street side, shutters were installed, fixed closed in the eight recessed panels which matched the four actual window openings. This revealed for the first time the carefully studied fenestration that Latrobe intended, and which he planned to treat in some such way, as his section shows these window panels dotted in front of the chimney flues. On the front the broad wall piers were lightened by Ihe window shutters and the scale of the design was restored by the reinstatement of the arched doorway and small flanking windows. As a practical necessity at this time new window sash was installed throughout the facade. As far as the detail for the restored features of the front is concerned, it is all (except the design of the muntins in the fanlight) derived from the house or the drawings. The window frames, sash and shutters are duplicates of those on the north elevation, and the doorway was rebuilt from Latrobe's original scale and full size details. Location: 748 Jackson Place, N. W.